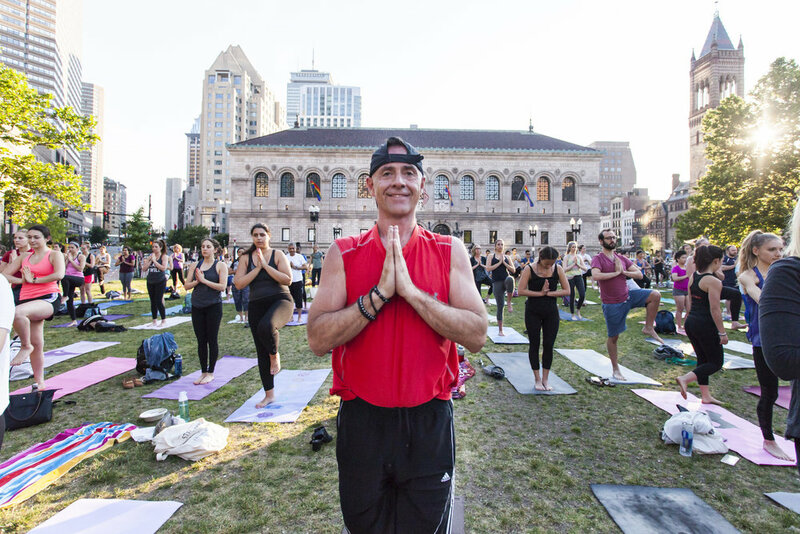 On Thursday June 21, 2018, hundreds of Bostonians gathered in Copley Square to celebrate International Day of Yoga. This was the 4th year since the UN officially proclaimed this day to recognize yoga as an invaluable gift from India's ancient culture. To mark the occasion, Yoga for Humanity teamed up with YogaHub Boston to hold a a free, public yoga class in the heart of Boston along with a health and wellness marketplace. It was a beautiful, warm, sunny day - perfect conditions for the first day of Summer. In the afternoon, we hosted a marketplace with local vendors, including our sponsors GoLive Probiotics, Mindbody, and Boston's own Fierce + Regal. We also had local yoga and wellness companies like Athleta, Backcountry Yoga, Oxfam, Sweetgreen, and YogaWorks. Then in the early evening, Ali Singer, founder of YogaHub Boston, taught a free yoga class on the Copley Square lawn. Hundreds of yogis filled the space as the sun started to set behind the buildings of the Back Bay. The yoga class was free and open to practitioners of all levels. Beginning with a continuous "sea of om" , Ali lead the group through a minute-long chant of Om, uniting everyone together with the sacred sound. She then guided everyone through an hour of vinyasa yoga, syncing breathing with movement. It was a beautiful sight to see Bostonians from every walk of life come together to practice yoga. By all measures, the first ever Yoga Day Boston was a huge success and we can't wait to do this again next year.